Will Baby Boomers’ Retirement Affect Idaho’s Economy? Baby boomers have been shaking the economy ever since their birth. Now, they are starting to reach traditional retirement age. How quickly they retire and how high their incomes are after retirement will have a significant effect on Idaho’s economy. What was the baby boom? Since their birth in the 18 years after World War II ended, this enormous generation has affected the economy. In their childhood, they dramatically increased the demand for baby paraphernalia, children’s clothing and toys. As they entered their teens and began working, they swelled the ranks of workers, spurring U.S. productive capacity. Now, they are in their 50s and 60s, and they may be rewriting what it means to be a senior citizen. They were born during the “baby boom” that followed World War II. Americans had dramatically reduced births rates during the Depression that began in 1929 and lasted until America entered the war in 1941. During the war, millions of Americans put off marriage and children. Once, the war ended in August 1945, marriage and babies were high on the agendas of millions. 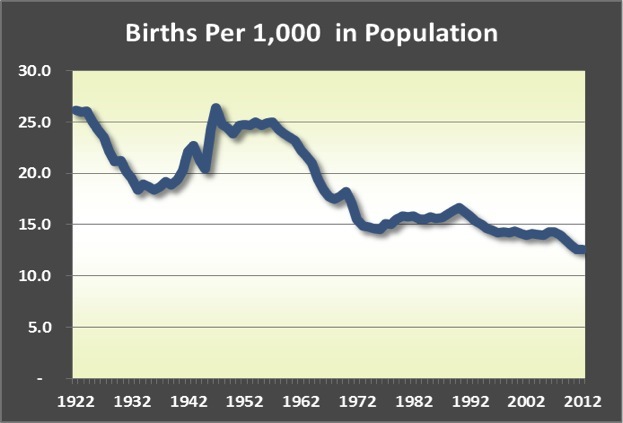 Starting in the mid-1960s, birth rates began to fall. The generation born during the “baby bust” between 1965 and 1982 is known as Generation X. As baby boomers who had postponed marriage and children began having them in the mid-1980s, there was a “baby boom echo.” Those born then are known as Millennials. In 2007, births reached 4.3 million, exceeding the previous record set in 1957 by just 8,000. The baby boom stands out even more compared to recent decades when looking at birth rates – the number of births per thousand people. The population of the United States more than doubled from 151 million in 1950 to 309 million in 2010. So even when the number of births in the past decade were in the same range as during the baby boom, the birth rate is about half of what it was then. Birth rates before 1925 were even higher than during the baby boom generation because people married younger, started having babies earlier and kept having them. Large numbers of young immigrants also moved in, further increasing birth rates. The 1920s was the first decade when reliable forms of birth control became widely available. Family sizes have changed dramatically since the baby boom. In the 1950s, the average American woman had about 3.8 children during her lifetime. By the 1990s, she would have about 2.1. In recent years, the births per thousand people in the population also have declined because of the aging of the population. With a much larger percentage of the population over 50 and past normal child-bearing years, the birth rate has dropped. The number of babies born in the United States fell sharply after the recession began and continued to fall until 2012 when it plateaued. Altogether, between 2007 and 2011 the fertility rate – the total number of babies born per 1,000 women ages 15 to 44 – fell 9 percent. All types of women decreased their birth rates with young Hispanics having the sharpest decline. Fertility dropped by one-third among Hispanic women 20 to 24. At the current rate, the average American woman would have 1.9 babies over her lifetime. That is below the replacement rate of 2.1 babies, where Americans hovered for a couple of decades before the recession. Idaho births also fell sharply after the recession began – declining 11 percent from 25,025 in 2007 to 22, 311 in 2011. The ranks of senior citizens are swelling rapidly as the baby boomers turn 65 while the number of people turning 16 has grown more slowly. 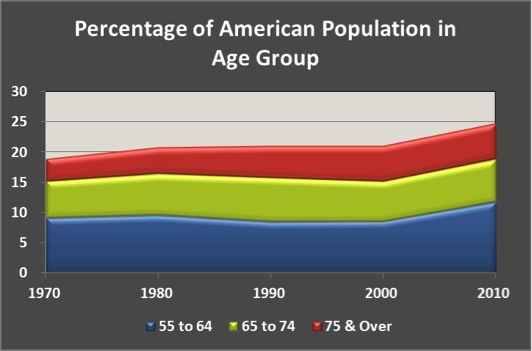 The number of seniors also is growing faster than the population because today’s seniors are living far longer than earlier generations. In 1935, life expectancy for a newborn boy was 59.4 years. A man who had lived to the age of 30 could expect to live to be 67.3 years old and a man who turned 60 could expect to live to 74.8. Today, a baby boy’s life expectancy is 75.4, and a 30-year old man can expect to live to 76.9 while a man turning 60 can expect to live to 80.3. With the baby boomers just beginning to enter the 65-and-over age group, the tremendous growth that has already occurred in that group will pale in comparison to what happens over the next 15 years. 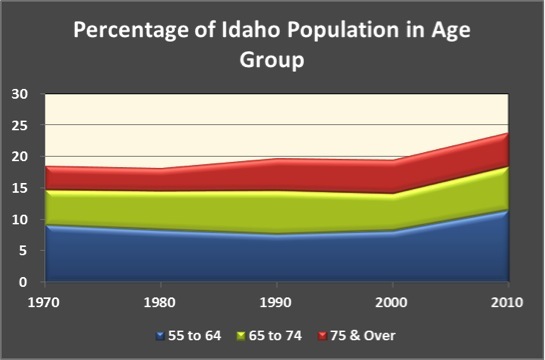 The aging of the boomers will have many implications for the American economy and Idaho’s future. • In the June issue of the Idaho Department of Labor’s Idaho Employment newsletter, Will Jenson outlined the growing need to replace baby boomers as they begin to retire. With much fewer Generation Y workers to succeed them, maintaining an adequate labor force could be challenging. If the replacement process is not done well, it could lead to reduced productivity, which will mean lower incomes for many Americans. • Training new workers and preparing existing ones to replace retiring boomers will force employers to consider the loss of institutional knowledge. Many people who have worked on a job for a long time have insights and understanding that need to be conveyed to others. A poll conducted in January by the Society for Human Resource Management and AARP found 72 percent of human resource professionals believed the loss of talented older workers was “a problem” or “a potential problem.” However, only 5 percent had implemented policies and practices to address the loss. • How fast an economy can grow depends on how fast its workforce can grow. The cohort of Millennials is slightly smaller than the cohort of boomers so as they replace boomers, the U.S. economy is likely to grow more slowly than it did in earlier decades when the potential workforce was expanding rapidly. • As they retire, boomers’ incomes will go down, reducing the buying power of the average American consumer. This also may have implications for economic growth. • Social Security benefits are becoming a larger percentage of personal income as Americans age. Social Security is more important to Idaho’s rural counties than in its metropolitan counties. 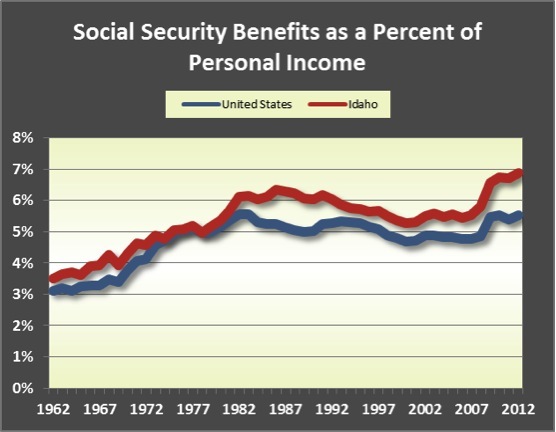 Social Security benefits made up 7.5 percent of personal income in Idaho’s rural counties in 2012 while they provided up 6.5 percent of metropolitan income. • As people age, their tastes and needs will change, resulting in less demand for manufactured goods including automobiles, appliances and clothing and greater demand for health care, residential care, lawn care, housecleaning, travel, money management services and other services. • As boomers grow older, health care jobs will grow even faster nationwide and in Idaho. • With today’s seniors generally enjoying better health and given the effect of the financial crisis and recession on nest eggs, many seniors plan to keep working into their late 60s or even early 70s. Working longer is a greater possibility today since physical labor is playing a smaller role in the economy. Labor force participation rates have increased dramatically for older workers since the late 1980s. In 2012, about 23 percent of Idaho’s population 65 to 74 years of age participated in the labor force. In 2000, about 19 percent did. The number of Idahoans 65 and over holding a job covered by unemployment insurance nearly tripled from 8,447 to 24,707 between 1992 and 2012. • The aging of the workforce may result in some losses in productivity since jobs requiring physical stamina, speed, keen eyesight or motor coordination become more difficult for workers as they age. Older workers also tend to be less likely to adopt new technologies including social media. On the other hand, many employers report that older workers have high work ethic and better customer service skills than many younger workers. • Idaho has a proven ability to attract retirees so the growth in the U.S. retired population may be a benefit. But the upcoming generation of retirees may be less wealthy than earlier retirees because of poorer financial management, fewer pensions, loss of wealth in houses and stocks during the financial crisis, lower interest rates, greater levels of debt and the fact that many were forced into early retirement by job losses during the recession. In addition, more boomers are telling pollsters that they plan to grow old in their current communities. The close ties between boomers and their children may be one of the factors making it less likely that boomers will move when they retire. In August, MoneyRates.com selected Idaho as the state offering the most retiree-friendly conditions. It looked at the growth of the senior population; economic factors including the cost of living, taxes and unemployment; violent and property crime rates; the climate; and life expectancies at age 65. Iowa, Hawaii, South Dakota and Oregon came in second through fifth. • Debt is more common for today’s seniors. The median level of debt among households led by someone 65 and older rose nearly 120 percent from $12,000 in 2000 and $26,000 to 2010. The median debt load for households led by people aged 55 to 64 grew 64 percent to $70,000. • A majority of Americans with 401(k)-type savings accounts are accumulating debt faster than they are setting aside money for retirement, according to an October report by HelloWallet, a firm that conducts research on economic behavior. About 64 percent of workers accumulated debt faster than retirement savings between 2009 and 2011. Many of those with high levels of debt are in their 50s and 60s. • Nest eggs have been eroded. About 48 percent of people aged 61 to 70 and in the bottom half of the income distribution withdrew money from their IRAs annually between 2002 and 2010. Withdrawals averaged 15 percent, according to a May report by the Employee Benefit Research Institute. About 63 percent of workers displaced during the recession dipped into their retirement savings to pay bills, according to a 2012 study by Transamerica Center for Retirement Studies. • About 59 percent of households headed by people 65 or older have no retirement account assets, according to Federal Reserve data. The median 401(k) balance for households of people ages 55 to 64 was $120,000 in 2011, according to the Center for Retirement Research at Boston College. That is far below what is needed to provide the retirement income from a typical pension plan. • A MetLife Mature Market Institute study released in October found that more than 40 percent of recent retirees were forced to retire earlier than they expected because of health problems, job loss or care-giving responsibilities. A 2010 Urban Institute study found that working just one more year would increase retirees’ income in retirement by 9 percent. • Those who began taking Social Security benefits at age 62 will have lower Social Security benefits for the rest of their lives. Taking benefits early also limits the amount of earned income a beneficiary may receive. For workers who retire before the normal retirement age, an earnings test is applied. They lose $1 of benefits for every $2 of earnings they receive above $15,120. There is no loss of benefits for those above the normal retirement age. A Morningstar study estimates that people born before 1955 who take benefits at age 62 get only 75 percent of what they would receive at age 65. • When older workers lose their jobs, they usually find it takes them longer to find a new job than it takes younger workers. In August, the average duration of unemployment for workers 55 and over was 50.4 weeks compared to 34.2 weeks for workers under 55. In addition, a 2012 study by a Wellesley College economics professor suggests that the life expectancy of boomers ages 57 to 61 who lose their jobs (and health insurance) may be reduced by three years. This entry was posted in Employment News and tagged aging workforce, baby boomers, idaho department of labor, idaho economy, Social Security benefits on November 13, 2013 by Idaho Department of Labor. This is eye opening information. I had no idea that about 59 percent of households headed by people 65 or older have no retirement account assets. A lot of people may be working well into their typical retirement days.